Mondrar Henim is a Dunmer necromancer who is good friends with Mercator Hosidus of Castle Skingrad. Along with Hosidus and another friend, Arterion, Henim is determined to prevent anything interfering with Mannimarco's plans. He appears only during the Ulterior Motives quest. Once the related quest is active, he will travel to his ambush position in the High Pasture just outside Skingrad and will then wait completely still for your arrival. He wears the standard necromancer's robe and necromancer's hood and carries a leveled amount of gold. 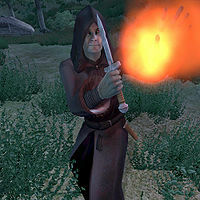 In combat, he relies on an iron dagger and on a set of leveled necromancer spells. This page was last modified on 25 March 2018, at 03:05.